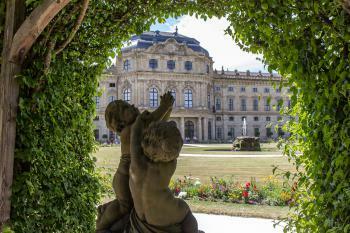 The Würzburg Residence with the Court Gardens and Residence Square represents a highlight in 18th century Baroque palace architecture. In 1720, the building of this baroque palace started on request of Bishop Johann. It is made of yellow sandstone, which provides a golden glow. The palace has 300 rooms, spread over 3 wings. 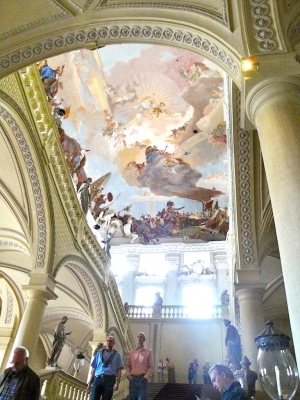 The ceiling over the broad staircase is decorated with frescoes made by the Venetian master Tiepolo. The paintings date from 1753, and portray the god Apollo and the four continents. At the end of World War II, the Residence was partly wrecked by bombs. However, the ceilings (and paintings) did survive. In the western wing lies the Hofkirche, an elegant red-golden church. The altar is decorated also with paintings of Tiepolo. The paintings made by Tiepolo are really marvellous. They are the no.1 reason to visit this site: they colourize this otherwise quite empty and bleak building. Würzburg is a quiet town in the South of Germany. Except for the Residence, the old bridge across the river Main (dating from the 15th century) with its statues, and the several churches are also worth visiting. I visited this palace in August 2011. Obviously it was forbidden to take pictures since I have only one picture of the famous staircase. While this residence does not rival other European palaces in size it is remarkable in several ways: it was built by a prince-bishop who was the sovereign over a small country. It was built by the greatest artists of the Rococo among them Balthasar Neumann and Tiepolo and it contains three of the most beautiful palatial rooms I have ever seen, in taste and refinement hardly rivaled by its greatest competitors. While baroque style often overwhelms me by its weight this rococo palace seems light and airy. When you walk up to the Beletage you pass the enormous staircase with the largest fresco in the world painted by the Tiepolo. It is a over-the-top apotheosis of the bishop and each side of the ceiling shows one of the four then known continents. It is very entertaining to study them and see what was considered typical for each continents at the time. It is full of exotic animals and shows even native Americans who practice cannibalism! If I remember correctly our guide said that the four continents should signify the "global" power and influence of the prince-bishop. The latter is also protrayed and with him Tiepolo, Neumann and other artists. The first room on the second floor is the "White Room" which is quite monochromatic and all over decorated by stucco by Antonio Bossi, a real genius, till then unkown to me. While generally stucco is for my quickly over-the-top, this is highly original and tasteful. He built this room in an extremely short time for a visit of emperess Maria-Theresia. Supposedly she didn't even look up and soon after that the artist turned crazy. The next room, the "Kaisersaal" is richer and more colourful but equally amazing: It is quite bright through the additional typical rococo round windows under the ceiling. It is full of paintings and statues glorifying the history of the prince-bishops, much of it by Tiepolo and Bossi. What I found most fascinating is how they connected painting, statues and decoration. Sometimes you have putti sitting on a cornice and it takes you a while to figure out that the upper body is painted on the wall but the legs are sculpted. Here you can easily spend half an hour or more if you are interested in the history represented and the art applied. The rest of the palace contains many more splendid rooms including the original oval room on the ground floor and the mirror room but none stuck in my memory like the three above. When we were there the church interior was completely covered by renovation work. Judging from pictures it offers another fascinating mixture of sumptuous decoration with spacial elegance. We didn't see the gardens probably for time reasons. I would love to go back and re-examine my impression and see the missed parts. If you are in Würzburg and have time and palace capacity there is a few kilometers northwest of Würzburg the summer residence of the prince-bishops in Veitshöchheim. 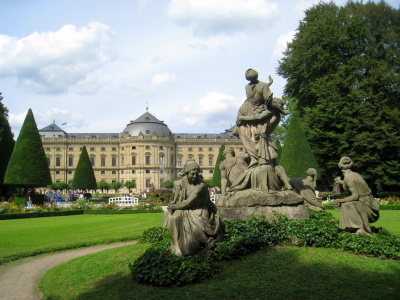 While the palace is much simpler then the Würzburg residence the garden is quite fanciful with fountains, statues of strange animals, grottos and ruins and conserved is in its original state. I wonder if they ever considered including this into the Würzburg application. I went with friends to Würzburg in May 2015, where we know a fellow studying at the city's university. The art historian Kenneth Clark visited the Residence in his landmark 1969 series Civilisation, in which he wondered how much the local people forked over in tithes and taxes in order for the bishop to build such a marvellous abode. Perhaps it was worth it, for the Residence houses one of the greatest works of the Venetian master Tiepolo (of whom more can be seen in the Doge's Palace). There are over 300 rooms in the residence, many of them restored since destruction in World War II. All-in-all, though, we came out of the Residence feeling a little underwhelmed. We had expected something grander, I think: a more impressive fresco with the wow-factor of those in the Sistine Chapel – however unrealistic that now seems. It was impressive, of course, but not what we had hoped. But there was more left to see. On a small sign I spotted an arrow pointing to the Residence’s Hofkirche, or Court Chapel. The work of Balthazar Neumann, this chapel really took our breath away, being impossibly ornate and riotous with colour and shape. Inside an inconspicuous wing of the Residence, Neumann took a rectangular space and transformed its interior into three overlapping ovals. Like with Gaudí, there are few straight lines. The overall effect is one of majesty, which must be so difficult to achieve in such a small space. What is so incredible about this site is to think that it was all basically destroyed in the Second World War and then painstakingly restored to exactly how it was before (for 40 years and at a cost of 20 million euros!). The building is enormous and everything is so grand and beautiful inside. Unfortunately you can't take photos inside, but it does give you the chance to look at everything in detail and soak it up. It takes at least an hour to walk through and see everything - even longer if you are really careful. Make sure you don't miss the gardens at the back of the residence (which are free to get into anyway). The landscaping is wonderful and I would suggest walking right up to the top at the back to get a view of the garden with the building to see how it all fits together. I visited the Residence in 1998 while vacationing and staying at a small hotel in Iphofen. I thought it was magnificent and enjoyed it during our dedicated day visit. I wondered what the total square footage was. I never did find out. I visited this WHS in May 2012. 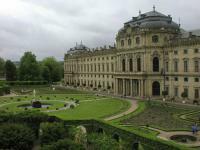 This Baroque palace with its gardens is one of the largest and most beautiful in Germany. The architectural symmetry of this Bavarian palace was the highlight of my visit. 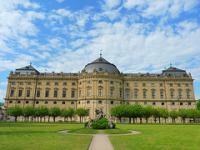 I have been to the Residenz many times as I used to live in Wurzburg and I visit whenever I am back in Germany. I took my family there a few weeks ago for the first time and they loved it. The staircase is an amazing piece of art and is always my main reason for visiting. It's beautiful and well worth the visit. I forgot to go into the chapel accessed from the side of the palace. Don't forget if you visit because it is also very impressive. All in all a very worthy WH site, and one that is very easy to reach as well. I visited The Residence in 2004 and unfortunately they were revamping the paintings on the ceiling so I didn't get to see the real beauty of it but did love the rest of the tour.I enjoyed the city so very much that I returned back the following September and spent more time there. I loved walking around Wurzburg, my hotel was a skip to the walking bridge across the Main. Visited many areas of Germany when I was there but loved Wurzburg the most. This grand building is definitely worth a visit. On the outside it might not look very special, but the inside sure is. When you walk up the stairs you will see huge paintings on the ceiling; what makes the paintings stand out is that they have lots of depth. Also in some places the ornaments that are part of the ceiling and walls blend right into the paintings themselves. In other rooms there are crazy ornaments on the wall up to the ceiling. In the "green room" with a wonderful wooden floor there’s lots of mirrors from where you can see each other from different points of view (ask the guide in the room about it). Finish your visit with a nice stroll through the gardens, and while you’re there, visit the town of Würzburg since it’s quite a pretty town. Franconia is always my favorite area in Germany and Würzburg is one of my many favorite cities in this region. The city itself is very nice with many beautiful old buildings and the Marienburg fortress on the hill can easily capture your imagination of romantic Germany – actually Würzburg is a starting point of the famous “Romantische Strasse”. However romantic can not save this city from the war, the city was almost completely destroyed during the WWII including the WHS in this city, the Residenz. Würzburg residenz is considered as a masterpiece of baroque palace designed by Balthasar Neumann and built by yellow sandstone making this palace glows like a shinning moon in the dusk. In my opinion it seems that the late evening is the best time to enjoy the magnificent feeling of this palace. The Residenz and its square are huge compared to other places in the town making the Residenz look more striking. The garden is also marvelous with many lovely flowers and statues. However, the palace’s inside gives the feeling of mix. The grand staircase is truly gorgeous with the fresco masterpiece by Tiepolo, Court chapel is just amazing, the green room is worth for special noticed, and about 10 lovely rooms of baroque and rococo styles which can be seen in many German baroque palaces like Schönbrunn or Sanssouci. After seeing of those mentioned, the palace becomes a long series of empty rooms with displays some ridiculous amount of fine art (OK the exhibition about Würzburg city after the war and its restoration work is quite interesting). I expected German or Bavarian government to restore the whole building to its former glory for both outside and inside, but my idea is not true. It is not surprised that I spend only 40 minutes to explore this big palace! (What’s a record) and not much tourists as I expected (I saw many tourist buses but they only come to see the exterior and garden – they are wise). It’s really hard to conclude my idea about this place, the exterior and the garden is truly great, some part of interior are very good, but the less of palace are unconvincing for the WHS status. I know of no other UNESCO “Evaluation” which is so peremptory in its conclusion as that for this palace:- “The inclusion of the Wurzburg Residence on the World Heritage List constitutes a measure, which is so clearly desirable that the proposal of the Federal Republic of Germany does not require lengthly (sic) justification.”. So that’s that then….! The WHS list isn’t short of “Baroque Palaces” but this is a great example of its type and, whether you like “Baroque” or not, should be seen by all “WHS enthusiasts” - if only for the giant Tiepolo frescoes. visited wurzburg in 1999. neatest thing i remember was the model of the city before it was bombed in WWII. you could really tell the allied forces were pissed at the germans. they pretty much leveled the city. stayed in a hostel that used to be a school. enjoyed my stay. the people were very friendly. food was great. the residence is worth visiting and the gardens were very pretty. My enthusiasm for Palaces is very low, however the main staircase of the Residence is well worth the effort to see. It is one of the finest pieces of Baroque art anywhere, and the work of two of the periods leading talents: Neumann and Tiepolo. The ceiling fresco is magnificent and is reputedly the largest in the world. You are not actually allowed to take any photos inside, but I did manage to take a few sneaky ones. 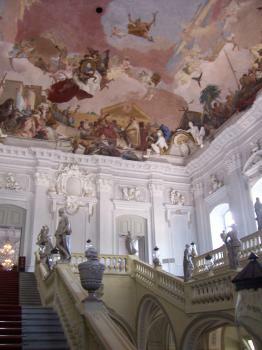 The decoration is on a much larger scale than the palace at Brühl, also by Neumann and also a WHS, but it is somehow a little more restrained, if you can use that term to describe Baroque. In the other rooms there are some impressive restorations going on and you do get a good idea of how the process takes place, especially interesting is the display on restoration after the damage brought by Second World War. After this it seems to be the usual route around the usual array of ornate bedchambers, wardrobes and halls, very impressive, just not my favourite things. The gardens were well laid out and free to enter, and worth exploring. As Frederik has said below the Court Chapel is amazing, well worth heading into even if you don’t go into the Palace itself, the paintings here are also by Tiepolo. The town of Würzburg is well worth some time on its own, with some lovely churches, an impressive bridge lined with Baroque statues a-la Charles Bridge in Prague and an impressive fortress, on the vineyard lined hill on the opposite bank of the river. The Youth Hostel offers lovely views of this in the morning. It is seems to be a bit of a train hub for Northern Bavaria, so should be very easy to get to. Würzburg is well worth a visit the Residence is a very worthy inclusion and the staircase is a masterpiece of Western European art. 3.0: Walter Gary Arndt Randi Thomsen Nan Klaus Freisinger Svein Heltberg Alias65 Tevity Frederik Dawson Peter A. 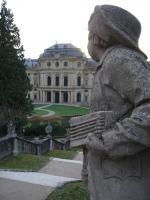 Universities: About half of the palace serves as the seat of departments of the University of Wuerzburg. Gilded Lacquer or Urushi: Grün lackiertes Zimmer with silver and green lacquer.